Diesen Samstag wird es wieder Zeit für WEBOOGIE im Chesters in Kreuzberg! Nach den letzten Partys mit Gästen wie Scratch DVA, Vaiper und Slick Shoota wird es diesen Samstag etwas Future-Funk lastiger oder wie die WEBOOGIE Crew schreibt: “…and once more explore new grounds in the wonderful world of Boogable Bass, 1,2 Step, Soul Claps and Vibesz, Vibesz, Vibesz.” Die vielversprechenden DJs B-JU aus Hamburg, SHAPE und L33 aus den Niederlanden sind diesmal zu Gast im Chesters! Checkt den Warm-Up Future/Modern Funk Mix von L33! We ve been long time fans of B-JU, Germany s best kept secret when it comes to the club sounds we love. Whether Soultronic Phonk, Juke, House or R&Bass, B-Ju covers it all with his versatile yet highly recognizable style. 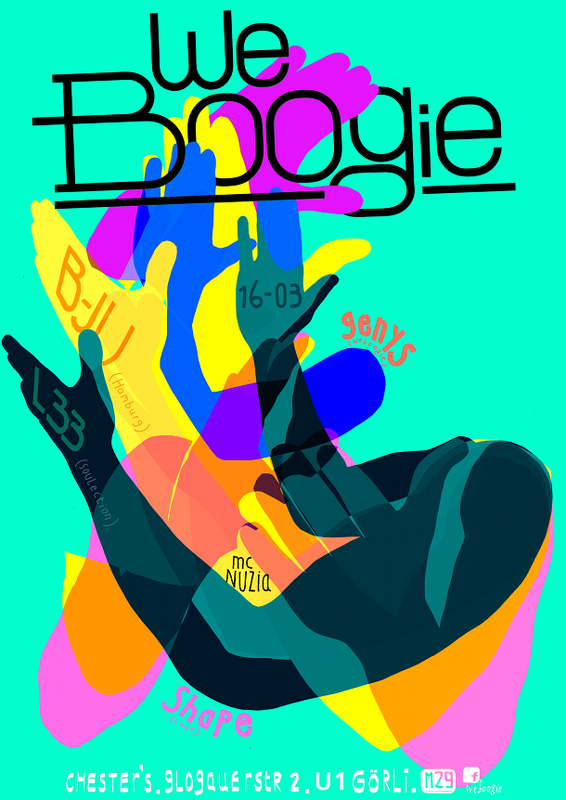 Always Deep, Melodic and Dancefloor proof, B-Ju s subtle jazz like compositions and hypnotic DJ-sets are like a bottomless pool of bubbly vibrations, in which we d love to drown ourselves. With support from the almighty Dam-Funk, Holland’s L33 might be considered one of Europe s brightest talents of the Californian Sunshine sound called Modern Funk: Lush synth pads, warm keyboards, tasty licks, fat bass lines and drum machines with the smoothness and grooves of 80s Boogie and early 90s RnB. Next to a special DJ-Set, L33 will give an exclusive preview of his forthcoming “VICTORY” LP on LA’s Soulection, the rapidly expanding worldwide movement bringing the Sounds of Tomorrow. Poppin & Lockin allowed. The homie SHAPE of the infamous VAST crew and our resident Baltic Bäng Bäng GENYS will add the necessary kick back and back it up jams. NUZIA will be back on the MiC.